Obelisk erected by the surviving passengers of the ship "Constitution" which sailed on 15 February 1855 commemorates the jubilee of their arrival in Australia and a reunion held on Empire Day (24th May). 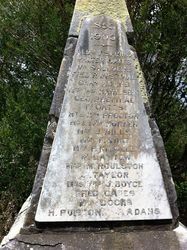 It also commemorates those who died on the voyage and those who died after arrival. SURVIVORS OF THE CONSTITUTION. 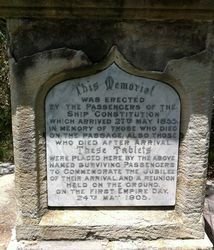 By permission of the Board of Health, a number of surviving passengers of the ship Constitution, which arrived in Sydney on May 27, 1855, from Southampton, assembled at the Quarantine Ground, South Head, and unveiled a memorial. The proceedings were of a most enthusiastic character, the chief speakers, being Alderman Spring (Mayor of Darlington), Mr. C. Adams (brother of the late Mr. George Adams), Mr. W. Gates, and Mr. G. Brentnall. 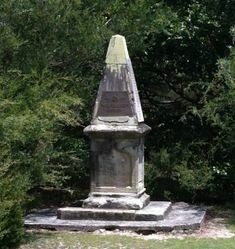 The memorial, which is erected on the hill, takes the form of an obelisk. 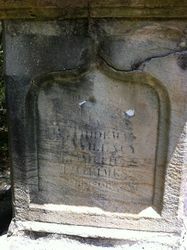 On it are two marble tablets: on one the names of the survivors have been engraved, and on the other the memory of those who died on the passage and of those who expired after landing at the Quarantine Station is perpetuated. After the unveiling the party boarded the steamer Cobar, where luncheon was served and further speeches were made. Evening News (Sydney), 24 May 1905. 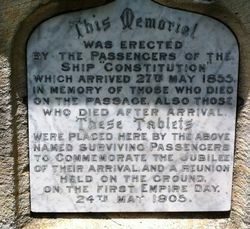 This memorial was erected by the passengers of the ship "Constitution" which arrived 27th May 1855. In memory of those who died on the passage, and also those who died after arrival. 150th anniversary of the arrival of the Constitution immigrants. Celebrated by their descendants to honour the optimism, the energy and the tenancity of these New Chums. 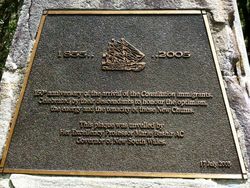 This plaque was unveiled by Her Excellency Professor Marie Bashir AC Governor of New South Wales.